When you come to a different university, city or country you always try to make yourself familiar with the new situation, regulations and opportunities. We want to help you finding your way around already before you come to FAU. For getting familiar with very important issues of daily life FAU offers a summary of important things to know about staying and studying at FAU. When you finally prepare for coming to Erlangen, there is an additional support by the FAU Buddy Programme. 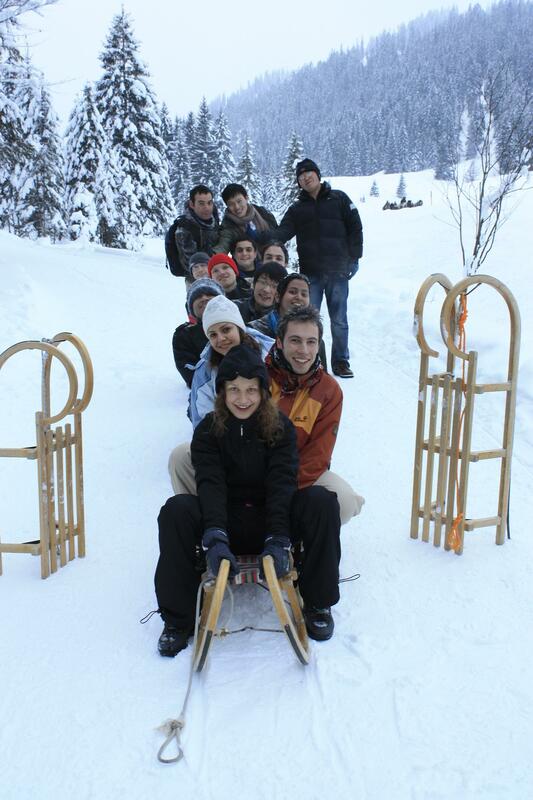 A senior student will help you getting started in Erlangen. Besides, you are welcome to get some insights into our fascinating area with its typical nature and landscapes, cultural heritage and awesome medieval towns and cities from the very first moment you consider joining MAP. And even if you will have a heavy workload to carry during your time as a MAP student you will still find some quiet moments that you can use to relax and to forget the hardships of life. Erlangen and its surroundings offer a huge amount of possibilities how you can spend your leisure time if you do not just want to hang out in your dormitory or the campus grounds but look for some more exciting or recreational pastime activities. Erlangen is situated in the centre of beautiful Franconia, a region occupying the northern part of the state of Bavaria. It is an prosperous small town with approximately 100,000 residents and is just a short journey by road or rail from the much larger city of Nuremberg. The center of Erlangen is dominated by a large square and a baroque palace (today the home of the university administration). The idyll of the adjacent palace gardens attracts many students and visitors, especially during the warm summer months. Shopping is not only possible on the main street that runs through the city from Rathausplatz to the Burgberg, but also in the modern Arcaden, a large shopping mall. Erlangen’s major employers are the university with its approx. 40,000 students and 13,000 employees and Siemens which has a large presence in and around Erlangen. The best ways to get around in Erlangen are by foot or – even more popular – by bike. Erlangen has, as a known eco-town, a well developed bike track network. You can optionally use public transportation that brings you quickly to all destinations in the greater metropolitan area of Erlangen, Fürth and Nuremberg. The airport at Nuremberg is close to Erlangen city limits and provides a link to German hub airports and other european destinations. Erlangen is located in the middle of a culturally and geographically highly appealing and diversified region. On youtube Erlangenweb channel, short videos about Erlangen are available in a few different languages, youtube MeinErlangen channel provides many interesting curiosities and facts about Erlangen. Nuremberg, which is located 20 kilometers south of Erlangen, does not only have a very charming medieval centre in which one can combine sightseeing and shopping but it is a stronghold especially for historically interested people. 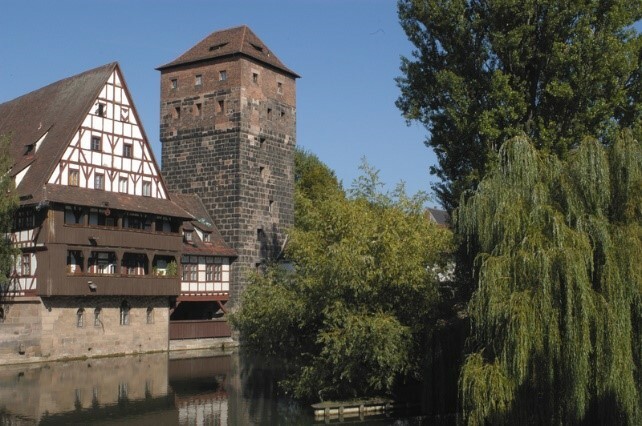 The medieval heritage of Nuremberg has been preserved in large parts in the old town and becomes particularly manifest in the fortress and the city wall. Visitors who would like to get informed about the more recent and darker past of Nuremberg can do so in the Dokumentationszentrum (Documentation Center) east of the city center. Not far from the Documentation Center is Nuremberg’s Zoological Garden which is always a popular destination. It enjoyed increased public interest in December 2007 when the polar bear “Flocke” was born. The city of Nuremberg also provides short introduction videos of this colourful city. Barely younger than its neighbor town is Fürth. The town achieved historical fame as destination of Germany’s first railway track (Nuremberg to Fürth) as well as being the birthplace of former US foreign minister and Nobel Peace Prize laureate Henry Kissinger. Erlangen belongs with altogether 23 administrative districts and eleven self-administrating towns to the Nuremberg Metropolitan Region. In its diversity, it is a unique and strong region in different fields as e.g. research, business, and tourism. The Nuremberm Metropolitan Region is proud to see excellence in many different fields. The video “Platz für Meister in der Metropolregion Nürnberg” gives insights into the world of sports, i.e. of basketball. More information on the Nuremberg Metropolitan Region. Further videos except the mentioned one above are provided bavaria/germany. Bamberg, the “Franconian Rome”, is located 40 kilometers north of Erlangen. A visit to this university town which has been awarded the title World Heritage Site by UNESCO is always worthwhile to see its beautiful architectural monuments. Being a university town Erlangen offers a variety of possibilites for cultural and social recreation. In addition to cinemas, theaters, the town hall and the culture center “E-Werk”, there is a huge number of pubs, restaurants, and dance clubs. There is, of course, also a big offering of varying events all through the year. 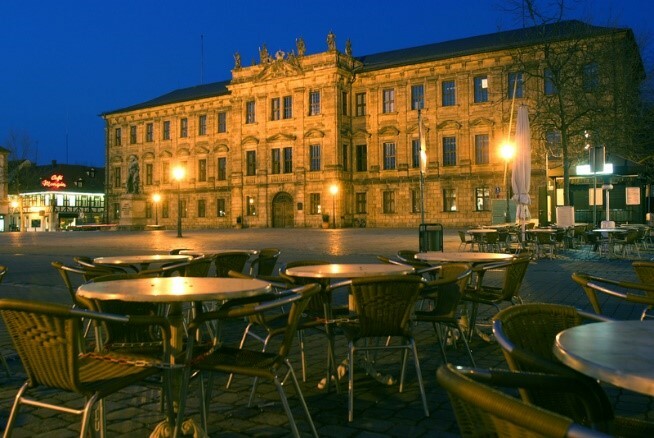 The cultural year starts with the traditional university ball of FAU Erlangen and the Nuremberg academies in January. Dance, musical performances, and a tombola are integral part of this festive event. Most of the yearly events take place during the summer months. 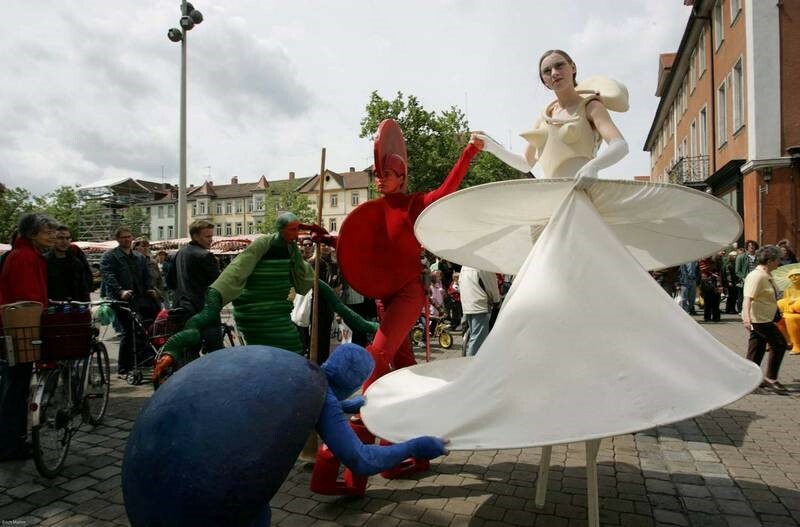 Art lovers can enjoy themselves during the “Blue Night” in Nuremberg in the end of May. Performances of musicians, artists and actors take place in the streets and the museums of the blue illuminated town all through the night. The participating museums can be visited free of charge during this night. One highpoint takes place yearly at Whitsun, the Erlangen “Bergkirchweih“, a kind of fair lasting ten days, during which visitors celebrate with music, rides, and, of course, with beer from the traditional mountain beer cellars. Only one week later the huge three day music festival “Rock im Park“ takes place in Nuremberg, that comes up with a musical armada of international artists anew every year. 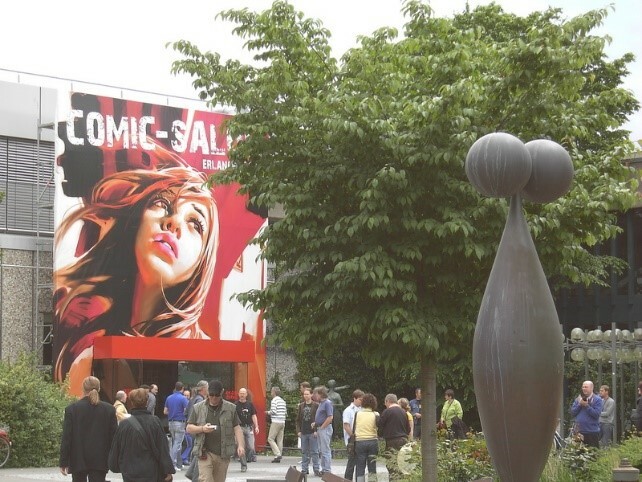 Likewise in June comic lovers get their money’s worth at the biennal “Comic Salon“ in Erlangen. Due to the changing thematic focuses and the gigantic variety of exhibitors and vendors it is an event that one should definitely see at least once. Cultural highpoint of the academic year is the “Schlossgartenfest”, an open-air ball that always draws many visitors in July. In August one is send back in time to the Middle Ages, can watch knights battle and see fair maidens during the “Tucher Ritterspiele“ in the moat in Nuremberg. Those who are more interested in the fine arts should not miss the Erlanger Poetenfest. Only every second year (alternating with the “Comic Salon”) the “Lange Nacht der Wissenschaften” takes place in Erlangen, Fürth and Nuremberg in October. Almost every institute of the university as well as a variety of industrial institutions participate as exhibitors. Visitors are allowed interesting insights into the scientific areas which they otherwise know only partially or not at all. The cultural years ends with traditional Christmas markets, first and foremost, of course, the world famous “Christkindlesmarkt“. However, the different Christmas markets in Erlangen are also worth a visit during Advent season, especially the medieval one on the Neustädter Kirchplatz allures with its appealing ambience. The Erlanger Tourismus und Marketing Verein e.V. provides further information about the cultural program in and around Erlangen. amongst them sailing, surfing, diving, and, of course, swimming. In addition there is a huge variety of possible recreational activities for “landlubbers” such as hiking, climbing, golf, horseback riding and many more. 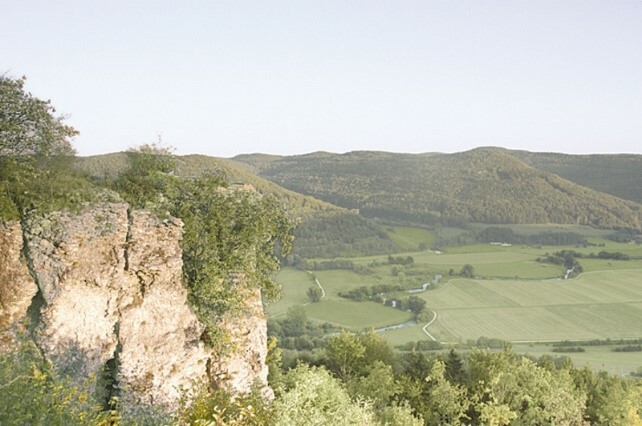 Northeast of Erlangen is the natural park landscape of “Franconian Switzerland“, that offers a wide range of sights and activities. The Wiesent river, for example, the “Franconian Whitewater”, is especially popular for canoeing in the summer. Those, for whom cycling and hiking through the beautiful landscape is not sufficient, can, for example, marvel at impressive rock formations and fossile remnants of cave bears in Germany’s longest cave, the Devil’s Cave Pottenstein. 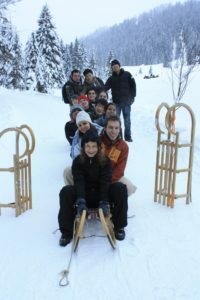 Skiing and sledging are possible activities in winter. The region is also renowed for its traditional food and drink and the village of Aufsess holds the world record for the highest ratio of breweries to residents. Those who are always mentally active need physical compensation. 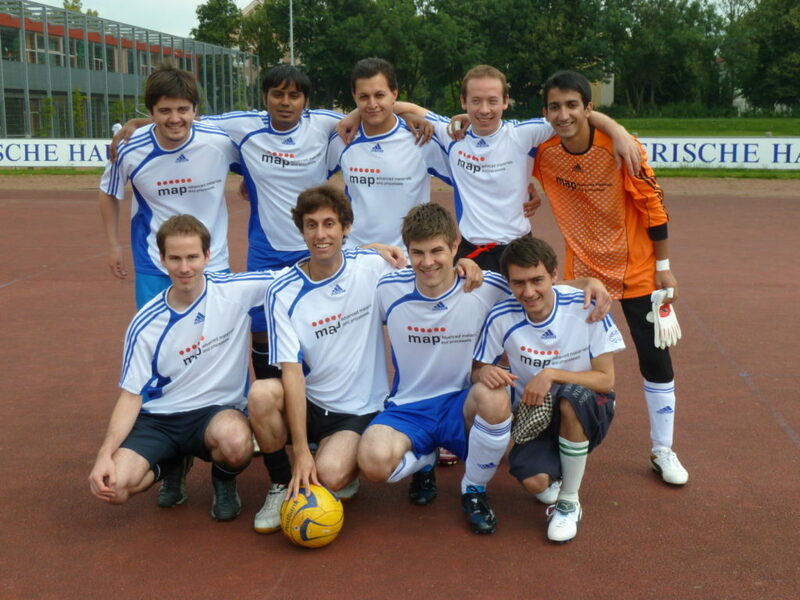 Students of FAU Erlangen-Nuremberg can use the low-cost offerings of the University sports program. The huge variety of sports range from martial arts to classic team sports like basketball or soccer to trend sports like Parkour and extraordinary activities such as gliding. For all those not finding the right sport at the university information about the local sports clubs and fitness centers and the respective sports is offered on the Erlangen info pages.